If splashing through the mud on a 4x4 sounds like your idea of fun you need to go quad biking! It might take a while to really get to grips with driving a quad bike, but once you've mastered it, you’re ready to take on the open terrain. Here's our guide to getting involved in quad biking. If you've never been quad biking before, this is probably the best option. A quad biking experience usually lasts between one and two hours (this may vary though). 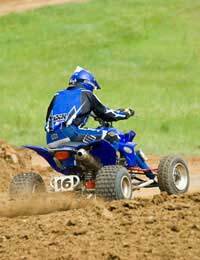 You'll be given a full safety briefing and introduction to driving a quad bike before you're allowed to have a go yourself. There's no need to bring anything fancy, but wearing casual clothes and a comfortable pair of shoes are recommended. Some packages will have a set dirt trail for you to drive on, but others will let you roam around the entire area, which is much more fun, especially when there are several drivers on the course at the same time as you! Quad biking experiences that take place in safari settings are becoming more popular in recent years, and offer a different alternative to the usual quad biking experience. Alternatively, there are off-road quad biking packages, which offer a crossover between quad biking and 4x4 off-roading. Package prices vary wildly, and a lot will depend on the length of your session, whereabouts in the UK your session is being held, and whether you are taking the package alone or with friends and family. You can expect to pay anything upwards of £30 per person for a one-hour session (safety briefings and driving introductions are included in the session length). If you’re anything like most people, it’s likely that you don’t spend much time with your colleagues outside of work. Corporate quad biking is a good way to introduce team spirit into your workplace, and you can get to know your fellow employees at the same time. Some corporate packages include team trials, which is a great chance to promote healthy competition among employees. As with the experience packages, corporate packages vary a lot in price. An average package costs around £50 per person, so it’s a good idea to persuade your employers to foot the bill as a birthday or Christmas get-together, especially if there will be more than a few attending. Battling the harsh terrain and getting covered in mud along the way is a typically male activity, so it's no surprise that quad biking is becoming a popular activity for Stag nights. It's often offered alongside off roading and paintballing. If you want to spend a day doing something a little bit out of the ordinary, quad biking could be the perfect solution. Bring along some friends for a bit of added fun, or invite your colleagues on a corporate package for some all-important team bonding. Quad biking experience packages make a nice gift for a friend or family member, particularly if you usually struggle to find the perfect present for them.